Colette, age 83, doesn’t own a car, but explained to whoever would listen that the steep rise of gasoline prices would also hurt people who don’t drive, by affecting prices of food and other necessities. She had done the calculations and figured it would cost a retired person 80 euros per month. A significant and recurring complaint concerned the matter of health care. France has long had the best public health program in the world, but this is being steadily undermined to meet the primary need of capital: profit. In the past few years, there has been a growing government campaign to encourage, and finally to oblige people to subscribe to a “mutuelle”, that is, a private health insurance plan, ostensibly to fill “the gaps” not covered by France’s universal health coverage. The “gaps” can be the 15% that is not covered for ordinary illnesses (grave illnesses are covered 100%), or for medicines taken off the “covered” list, or for dental work, among other things. The “gaps” to fill keep expanding, along with the cost of subscribing to the mutuelle. In reality, this program, sold to the public as modernizing improvement, is a gradual move toward privatization of health care. It is a sneaky method of opening the whole field of public health to international financial capital investment. This gambit has not fooled ordinary people and is high on the list of complaints by the Gilets Jaunes. Macron’s strongest supporter from the political class was Gérard Collomb, Socialist Mayor of Lyons, who was given the top cabinet post of Minister of Interior, in charge of the national police. But shortly after Hulot left, Collomb said he was leaving too, to go back to Lyons. Macron entreated him to stay on, but on October 3, Collomb went ahead and resigned, with a stunning statement referring to “immense problems” facing his successor. In the “difficult neighborhoods” in the suburbs of major cities, he said, the situation is “very much degraded : it’s the law of the jungle that rules, drug dealers and radical Islamists have taken the place of the Republic.” Such suburbs need to be “reconquered”. Saturday, November 17, demonstrators were peaceful, but resented the heavy tear-gas attacks. Saturday November 25, things got a big rougher, and on Saturday December 1st, all hell broke loose. 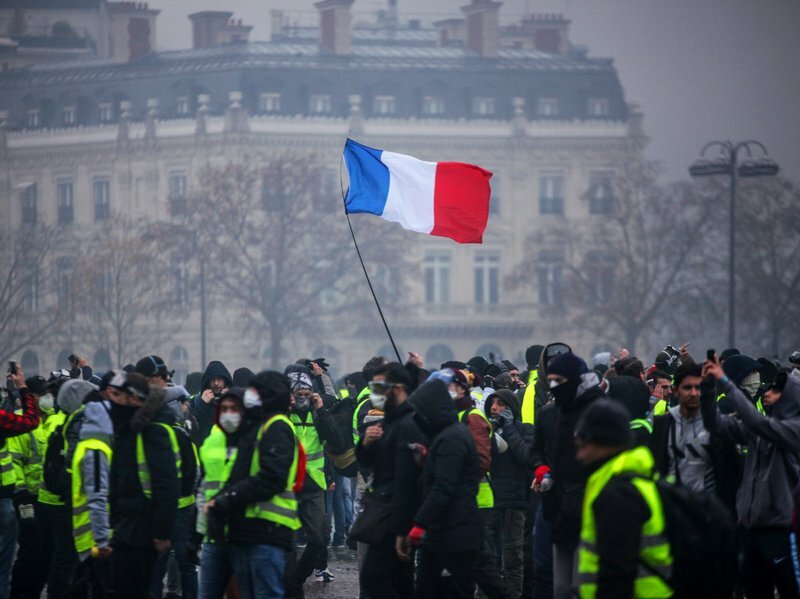 With no leaders and no service d’ordre (militants assigned to protect the demonstrators from attacks, provocations and infiltration), it was inevitable that casseurs (smashers) got into the act and started smashing things, looting shops and setting fires to trash cans, cars and even buildings. Not only in Paris, but all over France: from Marseilles to Brest, from Toulouse to Strasbourg. In the remote town of Puy en Velay, known for its chapel perched on a rock and its traditional lace-making, the Prefecture (national government authority) was set on fire. Tourist arrivals are cancelled and fancy restaurants are empty and department stores fear for their Christmas windows. The economic damages are enormous. Macron is a bubble that has burst. The legitimacy of his authority is very much in question. Yet he was elected in 2017 for a five year term, and his party holds a large majority in parliament that makes his removal almost impossible.